Social workers are counseing veterans coming to terms with how their actions during war may have violated their moral and ethical values. Social workers who provide services to veterans and their families need to be aware of the emerging issues of moral injury in soldiers returning from deployments. This term does not fit into the presently accepted medical or psychological diagnoses but is used to identify the circumstances in combat when "potentially morally injurious events such as perpetrating, failing to prevent, or bearing witness to acts that transgress deeply held moral beliefs and expectations" (Litz et al., 2009, p. 695). The resulting symptoms of shame, guilt, anger, withdrawal, self-condemnation, and self-harming behaviors may overlap in some ways with PTSD, but the two concepts differ. One of the major differences is that the precipitating event of war is not the focus as an unwarranted event to which trauma tends to be related. The central theme in moral injury is about the offenses against what is viewed as deeply held beliefs about moral and ethical standards that result in changes in the individuals' worldviews and have them questioning their spiritual faith. War veterans who have mental health problems, particularly those who struggle with trauma-related issues, showed signs of moral injury with alarming increases in suicidality (Drescher, Foy, Kelly, Leshner, Schutz, & Litz, 2011). Below are interviews with two war veterans who were in extraordinary discomfort about what they did during their deployments. Their distress, which later interfered with their civilian lives, relates to moral injury. Portions of these interviews are recounted in the following sections (V. L. Dripchak, interviews, May 21-23, 2015). Luke (not his real name) enlisted in the Army a year after graduating from high school. He was deployed twice to Iraq before fulfilling his enlistment commitment. Luke was interviewed about six months after ending his military career with an honorable discharge as a sergeant. "In some ways, I do miss the military life. I didn't have to think through things; I just did what I was told. In fact, thinking things through was not encouraged. You followed orders or gave orders that you were following, without questioning anyone. I knew why I was fighting and how to fight. "Now that I have been home for a while, I have had some time to remember all the killing that I was a part of. I do believe that I did this for my country; and to the best of my knowledge, I didn't kill any innocent people. We were told over and over again: Kill or be killed. So why am I feeling guilty and ashamed? Why am I always thinking about this? I guess I struggle with being in a foreign country and fighting against people who also were fighting for their country and their beliefs. In fact, in some ways, we were trespassing on their lands. "I was brought up with the belief of defending yourself or your family is okay but not to be the instigator of trouble. Now, I am struggling with how can some enemies who are living so far away be a threat? We were constantly reminded of what happened on September 11 can never happen again, and we needed to seek out these enemies who had attacked us. Being back at home, I am not certain that this was what we were doing. I also wonder why I have these doubts now, and why didn't I have them before. I am not certain that following orders is a good excuse anymore. My girlfriend thinks I am searching for some kind of forgiveness. She may be right, but who will give me this kind of forgiveness? "I can't say that I am a very religious person. My family brought us up to believe in God, and we went to church regularly. My minister could not answer what God thought about the killings that went on and continue to go on 'in the line of duty.' I mean, who gets to make those big decisions of where we go to fight? No, this did not help my guilt. I understand why some of the soldiers would say, 'You can lose God in the bunkers of war.'" Jeremy (not his real name) was honorably discharged from the Marines in 1974 with the rank of master sergeant. He initially was drafted but reenlisted for four years after his first tour was over. He was deployed to Vietnam and served in a combat unit. "After returning home from the service, I married my high school girlfriend and went to work in the town where I grew up. We have three wonderful children and four terrific grandchildren. I eventually opened my own business and now I am semiretired from it. "How do I feel about being in Vietnam … you mean that 'unpopular war?' Well, I have gone through a variety of feelings throughout the years. Initially, I think that I was proud to be a Marine. My family was proud of me too and that was important to me. However, after I had fulfilled my obligations and returned home, I was shunned by people who knew me. With others, I found out that it was better not to disclose that I was even in the war. I couldn't understand why some people wanted to blame me for being there when I was in the draft and sent to fight. "At any rate, I am not sure if their reactions finally got to me or whether part of me came to realize that I might deserve the way that I was being treated. I gradually became aware of an intense anger and disgust in myself. I tried to deal with these feelings by not wanting to really be around anyone (including my family); alcohol helped for a while, but then that became a problem, too. I even thought about suicide. "What did I do in Vietnam? It won't be popular to say, but the truth is that I did lead men to kill others, whom we considered to be the enemy … men, women, and children; we just didn't know until after they were dead. How do I make peace in my own mind about that? It is like the best-kept secret that everyone in combat knows about. So my shame and guilt go on … some of the feelings of disgrace become stronger during anniversaries, like the day that I arrived in Vietnam, the Marine Corps birthday, Memorial Day, etc." In sharing the narratives from Luke and Jeremy, the "invisible wounds" of combat become more apparent. At the same time, these types of injuries have become a well-kept secret. This may be attributed in part to the training that military personnel receive about having unquestionable strength and the belief that there is a stigma attached to admitting anything else. The overwhelming conflicts in values, which Luke and Jeremy encountered, arise between the ideals of being raised by the "Golden Rule" (and other moral standards) and the sanctions of killing during combat. However, it is important to be mindful that moral injury occurs to those who try to do right. The other factor to consider is where veterans can go for help to overcome these issues. Tick (2016) suggests that some clinicians may feel helpless or unprepared to deal with spiritual or moral issues; chaplains may be fearful of punishment to their careers if they confront the issues that produce moral injury. However, as Dokoupil and Snyder (2012, p. 42) state, "War itself, no matter how just or good, will leave many of the men who fight it feeling like they've dirtied their souls … there is just something about killing that bites the conscience and doesn't let go." Fortunately, for Luke and Jeremy, they eventually received services that helped them work through these areas. As Luke later disclosed: "One of the best things that helped me with my guilt was to be encouraged to say it all without thinking that I would be judged. Instead, I felt supported." Therefore, interventions by social workers need to focus on these deeply involved areas of moral injuries. As a way to further explore the area of moral injury from the viewpoints of social workers who provide services to military personnel, some interesting perspectives were found. Two of the responses that are written below reflect many of the opinions from other professionals within the sample (V. L. Dripchak, interviews, March–July 2016). Ralph has been a licensed social worker for 11 years. He also served in the Army in both the Iraq and Afghanistan fronts in two separate deployments. He currently is in private practice. "During the past several years, I have worked with many adult service men and women who had returned home from military assignments. While I do not use the term of 'moral injury,' it is a part of my focus of treatment. It is the demon that most soldiers, including myself, are facing after our return to civilian life. In fact, I think that it is really the underlying problem that we all know but are afraid to talk about. I facilitate groups in which much of the discussion is centered on how to make some sense out of the killing that was done during our tours, or the killing that we were a part of in some way. Many of the feelings tend to hit us when something happens in our families or in our jobs. For example, when you are teaching your children about forgiveness because they get upset with their friends, and yet you can't forgive yourself, or when some small mistake occurs at work and your anger goes from zero to 100 in an instant. At that point, you begin to think about the changes that resulted from experiences of being in combat. The members of the group are able to share their feelings with each other, and that helps some of them. I have found myself leaning more towards my own spiritual nature, working with them on forgiveness, and helping them move on in their lives. However, this has become the most challenging aspect of my job." Beverly is a licensed social worker who is employed as clinical director in a multifaceted family service agency. She has been in the social work profession for 21 years and currently performs administrative and supervisory tasks. Her agency works with veterans and their families in a wide arena of services. "The term of 'moral injury' was not one that I was entirely familiar with before you spoke about it. Now that I am thinking about it, it seems to me that moral injury is most likely to be an inevitable part of the lives of most veterans after they return to their civilian lives. I am not certain why we don't discuss it more. I know that when I went to school for my social work education, we did not incorporate areas of clients' morality or spirituality into our learning. As I work with newer social workers in the agency, they seem more at ease in discussing the spiritual needs of their clients but still not quite comfortable as to how to help their clients work through these dilemmas. They may refer clients to spiritual advisers (e.g., ministers), but I wonder if there is something more that we can do. I think that it is essential that we keep in mind that we are treating the whole person." There are a couple of important issues being raised through these interviews. The first one is whether our therapeutic encounters should be "value-free" and not deal with issues of moral standings. In keeping with this stance, some professionals question whether spiritual content be included in working with clients, while others assert that to deny or act as if spirituality is not part of any painful or difficult predicament is to ignore a large part of responses for many people (James & Gilliland, 2013). The second area is that very little time and training may be given in educational programs like social work to how to work through the impact of moral issues in therapeutic settings. Yet for most individuals who are involved in trauma-related issues, there is a challenge to find some kind of meaning for their adversity. It is critical to point out that as a first step, social workers need to be educated on these topics and reach a comfort level in discussing them with clients. In addition, we need to ask the right questions and assist clients to explore their more deeply held values in the process of recovery. Included in the training should be the view that in helping others who have moral injury, we cannot overlook the value of our own self-care. 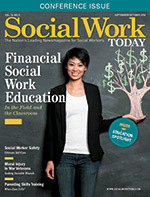 The profession of social work has always been in the forefront of providing services to meet clients' needs. Let's not miss this opportunity to continue this mission in working with our war veterans. — Valerie L. Dripchak, PhD, LCSW, is a professor of social work at Southern CT State University in New Haven, CT.
— Jamshid A. Marvasti, MD, is a child and adult psychiatrist and is on staff at Manchester Memorial Hospital in Manchester, CT.
Dokoupil, T., & Snyder, A. (2012). Moral injury. Newsweek, 160(24), 40-44. Drescher, K. D., Foy, D. W., Kelly, C., Leshner, A., Schutz, K., & Litz, B. T. (2011). An exploration of the viability and usefulness of the construct of moral injury in war veterans. Traumatology, 17(1), 8-13. James, R. K., & Gilliland, B.E. (2013). Crisis intervention strategies. 7th ed. Belmont, CA: Brooks/Cole, Cengage Learning. Litz, B. T., Stein, N., Delaney, E., Lebowitz, L., Nash, W. P., Silva, C., et al. (2009). Moral injury and moral repair in war veterans: A preliminary model and intervention strategy. Clinical Psychology Review, 29(8), 695-706. Tick, E. (2016). Military service, moral injury, and spiritual wounding. The Military Chaplain, 89(1), 4-8.